Share "How to Trim a Dog's Toenails"
Trimming a dog's toenails may seem like a simple task, but it isn't always easy. Many dogs are nervous and anxious when getting their nails trimmed, and improperly done, a badly cut nail could cause injuries or infections, as well as adding to the dog's stress. By learning how to trim your dog's nails correctly, however, you can save money on grooming and use trims as a chance to take better care of your pet. Do not use human nail clippers on your pet. Instead, choose either scissor- or guillotine-style clippers that are the right size for your dog's toenails. Larger breeds will require larger, sturdier tools, while smaller tools are best for smaller dogs. Keep the clippers sharp and operating properly so there is no struggle to use them. How often a dog needs nail trims will vary. Active dogs that walk or run on a lot of concrete or varied terrains may wear their nails down naturally, with no trims required. 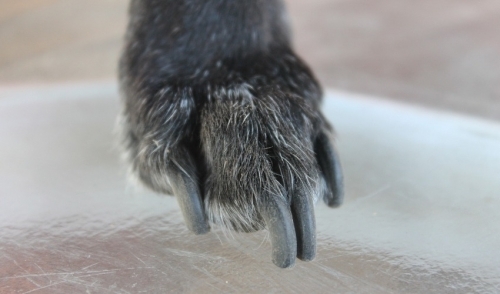 Other dogs will need their nails trimmed every 1-4 weeks depending on the speed of nail growth. Do not allow nails to grow too long, which can lead to discomfort and pain. Treat toenail trimming time as a positive experience for your pet, talking to them in a soothing voice and using treats, praise and pats to reinforce good behavior. This will help your pet stop dreading the procedure and can distract them from any minor stress or discomfort. Good, bright light will help you see your dog's nails more clearly so you can trim them safely and effectively. If you usually wear reading glasses, be sure you are wearing them when trimming toenails so you can see small color variations that indicate where to trim each nail. Hold your pet's paws firmly, separating the toes for easier trimming but do not harshly squeeze or squish the toe. Doing so may turn the nail so it is more difficult to cut properly, and will cause your dog unnecessary pain and angst. Be sure any fur on the paw is out of the way so it does not interfere with the clippers. The clipper blade should contact each nail from the bottom first, which will provide a better angle for a smooth cut to wear down naturally. Use firm, steady pressure to cut the nail, without wiggling the clippers back and forth to complete the cut. If you aren't sure how much nail to cut, use several small cuts to trim off more of the nail until it is the proper length. The core of a dog's nail is a living tissue rich with blood vessels, and cutting the nail too short can cause bleeding. While the bleeding should cease within a few minutes and will not cause significant blood loss, having some corn starch or a tissue available to help clot any blood can be useful. If you can see through the translucent tip of the dog's nail, note that the dark core is the living tissue, and avoid getting too close to it with any nail trim. If the trimmed nails are slightly sharp or have rough edges, you can file them slightly to smooth out the roughness and minimize the risk of painful scratching or snagging on carpet or upholstery. Most dogs, however, will naturally wear down those edges within a day or two. If you're nervous about trimming your dog's nails, ask your groomer or veterinarian for tips or a quick instructional session for how to do it yourself. They should be glad to show you how to properly trim nails, especially if your dog has dewclaws or any uneven nails that may require special treatment. Trimming your dog's toenails does not have to be an ordeal, and once you learn how to do it safely and properly, you'll be able to keep your dog's nails groomed with ease.